Naga Panchami, or the festival of snakes, is observed on the fifth day of the bright lunar fortnight of the Shravana month of the Hindu calendar and is dedicated to the worship of serpents mentioned in the great Hindu Puranas( Sanskrit encyclopedic texts containing cosmogonic histories, legends of gods and heroes, and other traditional material). The five "Naga"s or snakes worshipped on Nag Panchami are Ananta, Vasuki, Taxak, Karkotaka and Pingala. It is widely believed that the fifth day of bright half of the Hindu month of Shravana provides special pleasure to divine snakes and this is the reason Naga Panchami is still widely celebrated all across the India. According to one of the mythical stories, once the Naga Loka got blazed due to the maternal curse and this immense pain of Nagas subsided on the day of Naga Panchami. It made this festival so widely known. According to Bhagvata, when the king Janmejaya started performing Naga Yajna to destroy all the snakes, on the day of Naga Panchami, the son of recluse Jaratkaru, Aastik, rescued and saved them. This is one of the reasons of celebrating Naga Panchami. In various places all across India, it is a tradition to make five idols of snakes each with the five heads using gold, silver or the wood pen. The divine snakes are worshiped with milk, Panchamrit and Kheer. In its true sense, the festival of Naga Panchami inspires us to protect snakes. Every creature has its unique importance in preservation of environment and forests, and the snakes are one of the most pivotal creatures in this regard, and they are etched in over faith and tradition. The thousand-headed AnantaNag or SheshaNag is believed to be the couch of Lord Vishnu. It is said that the Lord reclines on Shesh Nag to relax between the time of the dissolution of one Universe and creation of another. This posture of the Lord over the snake Ananta is called AnanthaSayana. The serpent's thousand heads rise as a canopy over the recumbent deity and is also said to hold up the earth. Known as Ananta(the endless), Shesh Nag is held to be the symbol of Eternity. During Nagpanchami, women worship Ananta ( thousand-headed Ananta is Vishnu's couch ) the cosmic snake in temples. Vasuki is described as a great King of the nagas(snakes) who has a magnificient gem (Nagamani) on his head. Interestingly, Vasuki is mentioned not only in Hindu mythology but also in the Buddhist, Chinese and Japanese mythology. In Bengal, a custom of worshipping the female snake-deity Manasa still prevails and scriptures mention her to be the sister of Vasuki. The most prominent legend in Hinduism concerning Vasuki is the famous incident of Samudra manthan, the churning the ocean of milk. The snake king allowed the devas (gods) and the asuras (demons) to use him as the churning rope while they looked for the ambrosia of immortality. In Buddhist mythology, Vasuki and the other Naga Kings are seen to be amongst the audiences of many of the sermons of Lord Buddha. As the king of the snakes, their duty is seen to be leading their kinsmen in the protection, worship and honoring of the Buddha amongst the snakes and also to see that other enlightened beings are protected when in danger. 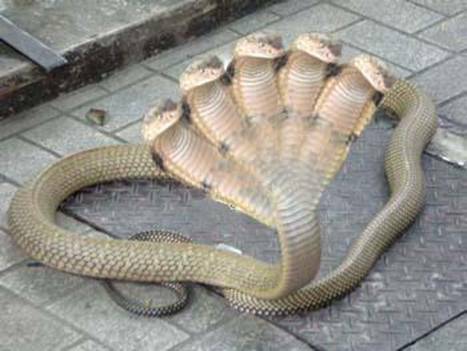 The Hindu scriptures describe Takshak as one of the powerful ruler of the snakes who killed king Parikshit, the descendant of Pandavas. According to legend, king Parikshit once insulted a great sage while he was engrossed in meditation and was cursed by the latter that he will die of a snake bite. To avoid the fulfillment of this curse, Parikshit built his palace on a single pillar surrounded by water with the belief that no snake could reach him crawling through the water. Then Takshak took up the challenge to honour the sage's words. He shrunk his body and hid in an apple. Just as Parikshit was about to eat the apple, he sprang out of it to regain his original shape and bit the king. In indignation, the king's son, Janamejay, kindled a huge sacrificial fire and upon his order the royal priests chanted powerful mantras(sacred utterance) which made all snakes fall into the fire. It was only on the intervention of the wise sage Astik that Takshak and the surviving snakes escaped the mass annihilation and the sacrifice was stopped. Described as a Nagavanshi king, Karkotaka was the divine ruler of the snakes who had deceived Narada and was cursed as a result. Because of this, Karkotaka could not move a step. When he got trapped in a fire one day and was about to be burnt, King Nal saved him. In gratitude, Karkotaka helped Nal to disguise himself so that he could win back his kingdom and reunite with his wife, Damayanti. Pingala is one of the names of the chief Nagas from the Adi Parvan. His name is related to the story of the "Four Great Treasures" mentioned in Indian as well as Buddhist literature. The "Mahavastu" mentions that the four great treasures are Sankha at Benares, Paduma at Mithila, Pingala in Kalinga and Elapatra at Taxila. Pingala is believed to be the guardian of the treasure hidden at Kalinga.